Issue 255, March 1986, where this article first appeared. The idea of Creative Camera without Colin Osman as Editor and Publisher seems slightly absurd. The magazine he helped found to promote the worth of photography as a medium of personal expression has passed through a number of evolutionary phases, undergone several metamorphoses, even done the occasional chameleon act. But it has always been watched over, guided and gently prodded by the same, generally benign father figure. We haven’t had many such figures in British photography, in fact I cannot think of any except Norman Hall and he belonged to an earlier generation. Good reason, then, that Colin’s absence from the helm should strike that absurd note. He was, indeed remains, quite unique. Over time, I have collected every issue of Creative Camera ever published. As far as I am aware, it is only one of a handful of complete sets in the world. I thought it would be interesting to assemble a mosaic of all the covers, from May 1967 (when it was still Camera Owner) until May 2001 (when it had morphed into DPICT). Note: In June 1996, the magazine was redesigned using a ‘dot-matrix’ typeface for the Contents pages. This typeface cannot be digitised using Optical Character Recognition (OCR) software. In most cases photographers’ names appear elsewhere in the text, but some omissions may have occurred. At the start of the 1980s, Creative Camera ran into financial difficulties and there was a gap in production. The set for 1980 comprises just 6 issues, the last two of which were double issues, ending in August. No further issues appeared until March 1981. During the course of the decade, several double-issues were produced. The issue of Creative Camera published in December 1999, No 361, was the last containing content in the style that readers were familiar with. 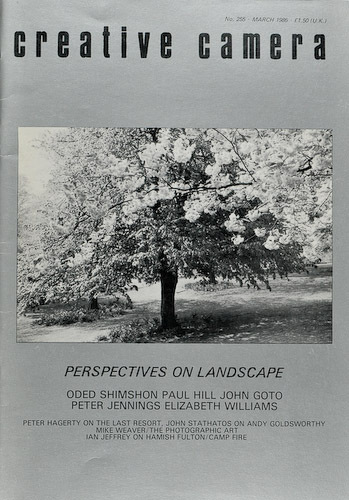 Issue 362, the last published under the Creative Camera masthead, was a ‘Source Book’ listing photographic resources and institutions world-wide. It also introduced the magazine’s successor, DPICT. From April/May 2000, the magazine changed its name to DPICT. The design, layout and typography of DPICT make it very difficult to render with OCR software. Although every attempt has been made to enable useful searchable content, there will be omissions. In the last issue of Creative Camera to appear under that masthead, Issue 362, editor David Brittain gives an introduction to its replacement, DPICT, which appeared in April 2000. Advances in digital printing technology were utilised to print customised copies with over 500 different covers for the first issue.